Why has it been so foggy in the Great Lakes recently? For the past week or two, many folks around the Great Lakes have been waking up to foggy mornings. Visibilities have frequently been below a mile, making it difficult to commute to work or school. But WHY has there been so much fog recently? If you’ve been aware of the weather for the past week and a half, you know it has been unseasonably warm. Many towns in the Midwest have seen temperatures more than 20 degrees above average. In fact, South Bend, IN on Jan 21st, recorded a temperature of 61°F, 30 degrees above the normal high! Fog also happened to be a huge concern that night and the night before. The recent warm weather has been the culprit for the fog. However, there are a handful of different types of fog. The one seen in the Great Lakes region recently can be classified as “advection fog”. Because it is January and many folks have already seen snow this winter, the ground is cold. This is not the time of year you should be digging a garden by hand. Freezing temperatures keep the ground hard during the winter months. The recently unseasonably warm air came from the south from the Gulf of Mexico, bringing along with it a lot of moisture and spring-like temperatures. As the warm air passed over the cold ground (see picture below), the air cooled down to the dew point, which saturated the air and caused it to condense. Thus, a cloud, or fog, formed right above the ground. This type of fog usually occurs during the late winter and early spring in the Midwest because warm air rides over the cold, snow-melting ground. It just so happened that places saw the warm air as early as mid-January! Forecasts show that colder, drier air is on the way, so there should be a bit less fog out there for the Great Lakes region. For your latest Michiana forecast, go to ABC 57 Weather. The TV News/Weather industry is exciting and always changing, but is also one of the most demanding industries out there. There are so many career and personal rewards with broadcasting, but those come with the challenges of unhealthy hours, time away from home, and constant movement. In the past month, I had the special opportunity to talk with ABC’s Good Morning America and World News Tonight Chief Meteorologist, Ginger Zee. I discovered the personal side of Ginger and found out how she balances the career of a lifetime with family, friends, and other pursuits she has. Four years ago, the hard-working mother of one and wife of New York-based TV personality Ben Aaron never thought that she would have a beautiful son and “the best husband in the world”. Now, her definition of success not only includes her career, but also her son and the life adventure she is undertaking with her family. The following is my interview with Ginger Zee. Me: What is it like balancing work, family, and friends in one of the coolest, yet demanding TV jobs in the world? Ginger: That’s the challenge. I think the answer is: I do not know if I do it perfectly because I do not think anyone can. But allowing yourself to have the imperfections and to have some days where you’re not around as a mom as you’d like, or some days you can’t be there for your job because you have to be a mom. I think you need to allow yourself those times where you fully commit to the moment that you are in, and try to do it all to the best of your ability. That is really all you can do. That is something that I learned while doing Dancing with the Stars because I didn’t have any time. I was doing basically two full time jobs, and being a new mother. That really forced me for the first time in my life to genuinely live in the moment. I didn’t have time to procrastinate. When I was with the baby I had to be one hundred percent with the baby. I never picked up the phone. I never tried to multitask. And I think as long as you try to be present wherever you are, that is the best you can do. Me: I’m sure your family really does appreciate you trying to strive to do that. Ginger: Yeah, I think now that he is so young, he just needs love, no matter where that comes from. He needs love, comfort, to be clean, fed – the very simple part. I think being with him and being more present in his life even more later might even be more important, than earlier. Either way, I’m proud of all the things I am able to do, and I’m very very pleased that I have the opportunity to do it because I’ve got the best husband and really great friends and family. Me: Speaking of your husband then, what is it like being married to another person in the TV industry – is it a strength or challenge or both? Ginger: I think the first definitely – There are definite challenges, in that we both have, I would say, the unhealthiest schedules. But in a way that could be a very good thing too. I think of the day that Adrian (her son) has a class play or whatever it is. One of us will always be able to say I’ll be there because we don’t have the typical hours. Holidays are going to be different, vacations are going to be different, just life is different! But I think in general I am very fortunate to have someone who understands this industry, and not only gets it but lives it too, so we have an understanding on both sides. Me: What is the greatest joy about being a mom? Ginger: I feel like there are so many. Everybody says that it is awesome but I think the best is when I hear him laugh. [Watching] this person made from you and seeing the pure joy that a child can have, that is probably my favorite part – being able to be a witness to that: to somebody starting over. It really does change the way you look at life. The way he looked at a rubber scraper, the kitchen tool, yesterday, you would have thought it was the coolest thing on the planet, and it is pretty cool (laughing)! It really makes you think and wows you. That is probably the best part. Ginger: In life or in TV? Ginger: So on TV I would say I have been able to do, because of this place at Good Morning America and ABC New York, so many different opportunities that I’m finding that I really love, like producing other shows, like the show Food Forecast that I’m doing for our digital network. That to me is this in-depth way of taking science, that I love, and communicating it with food and drink that people love and I love as well. I’m finding ways to make people care about the stuff that I am trying to talk about on a regular basis and having the ability to have a long form where you do not have to do it in thirty seconds. I get to actually tell the story and meet a character, or many characters. The documentary-type style/food show that I’m doing is a dream come true, I’ve been pitching that idea forever. So that is something that I love doing. In life, I just love being with my family. I feel the most fun we have is when we’re just playing on the living room floor, letting Adrian crawl all over us. I mean it’s very simple and fun to do. We get invited to a lot of things. We say yes to very few and we make it to even fewer… (laughing) I mean it’s so great to live here and have all these opportunities. It is very hip but we aren’t hip at all. We’re pretty boring (laughing). But we like that. That is another thing that works for Ben and I. We aren’t too involved with any scene. Sometimes I wish I could force myself to but I’m not very good at it. Me: What would be your advice entering the TV industry who are wanting to have a strong family dynamic in their lives? Ginger: After I was a freshman in college I really hadn’t made the intention of doing that but I had an internship with James Spann, who is in Alabama and who is very well known in the weather community. But when I was interning with him, I saw something that I hadn’t seen a lot of. It was brand new to me so I thought everybody could do that. James is a guy who would talk about balance. He’s a business man and he’s one of the best meteorologists on TV, he serves his community, but at the end of the day, he always makes it home for dinner. Unless there’s a EF-5 [tornado] on the ground, he’s home with his family. I saw him live this great life. I thought ‘oh I want to do that! That’s what I want to do’. I think I struggled for a very long time because there are points where you have to choose between your career over your personal life. I feel so fortunate but if you would have asked me four years ago if I would be in the place that I am, with a baby and married, I would have said no way! I never thought it was possible to have both. I think you just have to be open to that and find your priorities in life. So my priorities shifted a little and I was fortunate enough that I made it in my career to a place that I’m very pleased with but I’m always wanting to grow too. And I found a person who understands that. So I would say that it is very difficult and that’s the bottom line. You cannot shy away from that. Family still to this day does not understand why I have to do a double shift on Thanksgiving. I’ve been doing this for 16 years and it doesn’t go away. News is still news, no matter what level you get to. All the other glamorous stuff aside, when you’re covering lake-effect snow, everybody is standing in the same lake-effect snow, stuck on the highway. When you’re covering a tornado, nobody has a restroom to use. It is all news and it is all weather. It all goes back to that no matter where you are. Me: That is one of my favorite questions to ask because when I start going into the TV industry, I really want to be able to keep that family dynamic but I know this one of the hardest industries to do that. I’ve seen some really cool people succeed, like yourself, and some others. Ginger: Yeah, and I think finding success is probably a important for yourself. But is success only a career, or the people around you? For example, James, I find him incredibly successful. So what I’m trying to say you need to redefine it for yourself and what you want. That is an important part of this. As long as you are doing the thing that you love and you get to go home and love that even more, that is pretty successful. Also something I miss a lot is teaching. It was like having kids and watching them grow up. Seeing them now, I take almost one hundred percent credit for it (laughing). You know, ‘without my guidance…’ (laughing). But it has been a lot of fun to watch and that [teaching] is something I hope to do in the future at some point. My mom always jokes that I should get a masters to teach. But not right now! But as some point so I could teach for real. Do you remember that story your teacher, your coach, or maybe even your pastor told you long ago? Story telling is an art form, engaging generation after generation. Here, we believe that the best stories are told from rocking chairs. And what is better than a weather story? Nowadays you can find so much weather information. Thanks to constant weather tweets, Facebook Live updates, and online video coverage of the next incoming storm, it feels like you are drinking out of a firehose. As a broadcast meteorologist I contribute to this steady flow, but I know me and other "weather weenies" want to see more but different weather content. Our atmosphere is complex, fascinating, powerful, and wonderfully constructed. It is so much fun to talk about. We need more weather-related articles, quizzes, and stories that are rocking-chair-worthy. 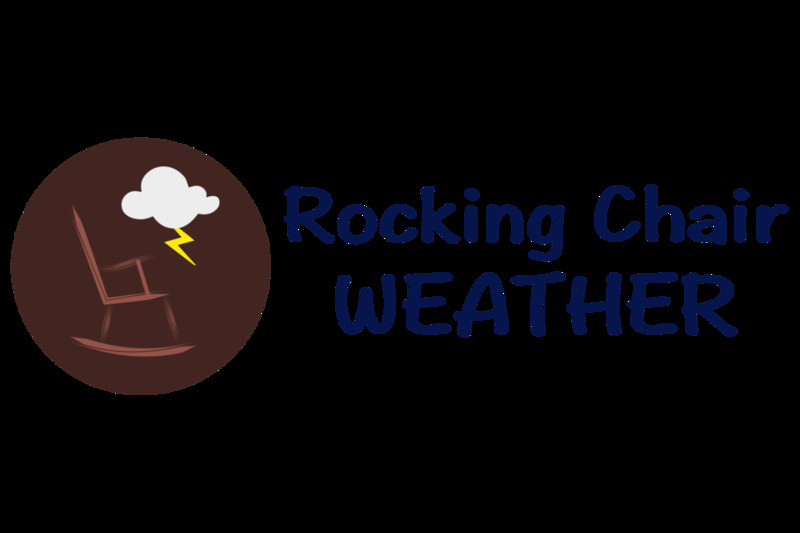 Enjoy your stay here at Rocking Chair Weather!